“Wishes and Dreams: Iran’s New Generation Emerges,” organized by the Meridian International Center in Washington and Tehran University Art Gallery, features the contemporary work of young artists living and working in Iran. The artwork -- paintings, installations and video projections -- highlights the major trends in Iran’s art scene, including abstraction, portraiture and minimalism. Fourteen of the artists in the exhibition are participating in the International Visitor Leadership Program sponsored by the State Department’s Bureau of Educational and Cultural Affairs. The cultural exchange is one of the U.S.-led people-to-people exchanges with Iran. Several of the artists joined Rice privately in the exhibition galleries and talked with her about their pieces. Some spoke English; others spoke through interpreters. 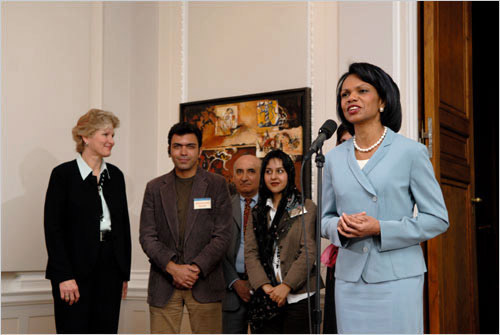 “It was a nice gesture,” artist Bahar Behbahani told USINFO of Rice’s visit. The exhibit, part of the U.S. effort to use artistic and cultural exchanges to foster better relations with Iran, will help Americans “better understand the Iranian people and appreciate the many interests we share,” said Ambassador Stuart Holliday, president of Meridian International. The United States has not had diplomatic relations with Iran since the Iranian hostage crisis in 1979. “The power of culture can broaden minds and touch the human heart,” said Dina Habib Powell, assistant secretary of state for educational and cultural affairs. The exhibit will remain in Washington through July 29 before traveling to several U.S. cities through 2008. For more information on U.S. policy, see Middle East Partnership Initiative and The Arts.